This is my final article of the 2014 Barkerville season. I started my second year of blogging for Barkerville back in May, as I eagerly anticipated a return to the streets as an historical interpreter after an eleven year absence. I had no idea how it would feel to be back out there, in my boots and bustle. I was excited, nervous and curious about how it would all turn out. And now here I stand, on the edge of autumn, gazing back at the past five months. Although the landscape of Barkerville remains much as it has been since I first joined its community of actor-interpreters twenty-one years ago, I have certainly changed. I now have two decades more life experience, including a Master’s degree in museum theatre, to apply to my work interpreting our unique gold rush story. I am now a wife and mother and a much older version of the woman who started working here all those years ago. I discovered, over the course of this season, that age and experience have made me a more grounded, insightful, and thoughtful interpreter. I simply have more perspective to bring to the history I have the privilege to talk about every day. I cannot deny, though, that my much older body has felt the effects of spending forty-plus hours a week, up on my feet, operating at performance level energy. In the dying days of this 2014 season, I am very tired, but I am also wistful about packing Barkerville up and putting her away for another year. Over the past five months I have so enjoyed watching Barkerville’s rich, altering scenery. In May the snowbanks loomed and I loved seeing them slowly melt, like constantly morphing sculptures. The winter-crushed grasses stretched to meet the sun as the last of the snow left and the brown land shook itself back to lush green. As spring rolled into summer the rain nearly drowned us, the sun baked our faces and the forest fires turned the sun blood orange. September brought in puddles licked with morning ice, and the splendor of changing trees bursting into golden glory before tossing their leaves to the afternoon winds in a swirl of crisp release. I will miss watching Barkerville’s ever changing scenery. Yes, I will miss our town. I will miss the thrill of telling our stories to world travellers, and the camaraderie between site staff. I will miss the crazy social whirl that accompanies the tourist season as we rush from our daily Barkerville duties to evening rehearsals of cabarets, or to potlucks or pub dates. And I will miss writing these articles. Writing for Barkerville has allowed me to reflect on what our National Historic Site means to so many people. I am glad that this place matters so much to so many. So, as a sign off for the season, please allow me to say thank you one more time for reading, for visiting and for keeping this place in your hearts and minds. Barkerville belongs to the people of British Columbia, and it is my privilege to be one of its caretakers. 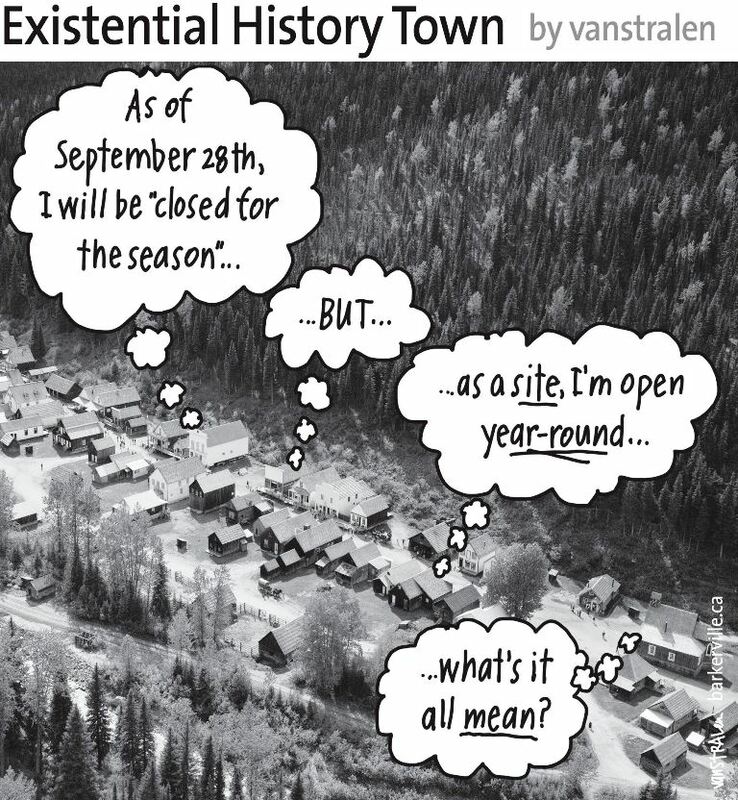 The above one-panel cartoon (originally published September 27th, 2014) by Dirk Van Stralen, with accompanying editorial by Danette Boucher, is the twentieth of twenty weekly entries that were logged – and subsequently blogged – as part of a 2014 collaboration between Barkerville, British Columbia and the Prince George Citizen aimed at introducing some of the quirkier advantages to living, working, and playing in the Cariboo Goldfields. We hope you enjoy! Dear Ms. Boucher: my family and I had the great pleasure of hearing Miss Florence Wilson’s story in the Kelly Saloon the first week of September this year (when some of us should have been back in school, but all of us thankfully were not); and of meeting her again on the main street of Barkerville later that day; and of joining in the end-of-day sidewalk celebration the next. Thank you for your and your colleagues’ work, art, and devotion. It has added to our love of characters, stories and history. Beautifully written, Danette. You know how much I love your one woman shows portraying Florence Wilson and Catherine Shuburt, but this article is pure poetry.